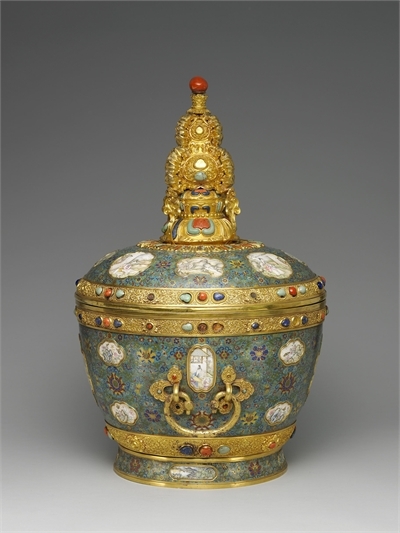 The most outstanding examples of cloisonné enamelware during the Qing dynasty were the painted enamelware. Painted enamelware entailed first applying a layer of opaque glaze to the surface of a piece, which was then fired, and then painting scenes over the glaze, before giving it a second firing, this time at a low temperature. 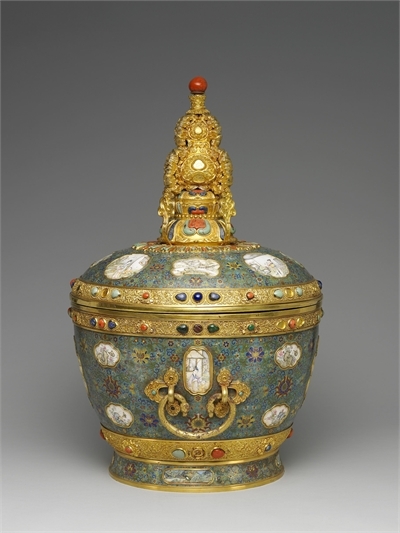 This tea jar, with its “Made in the Qianlong reign (1736-1795)” reign mark inscribed around the rim of the lid, is a full, round shape and boasts an ornate, ostentatious gilt-gold lid knob and three gilt-gold bands, each inlaid with coral, lapis lazuli and turquoise, in a distinctly Tibetan style. The jar is covered throughout with a filigree lotus scroll pattern on turquoise enamel glaze ground, interspersed with inlaid painted enamel panels. 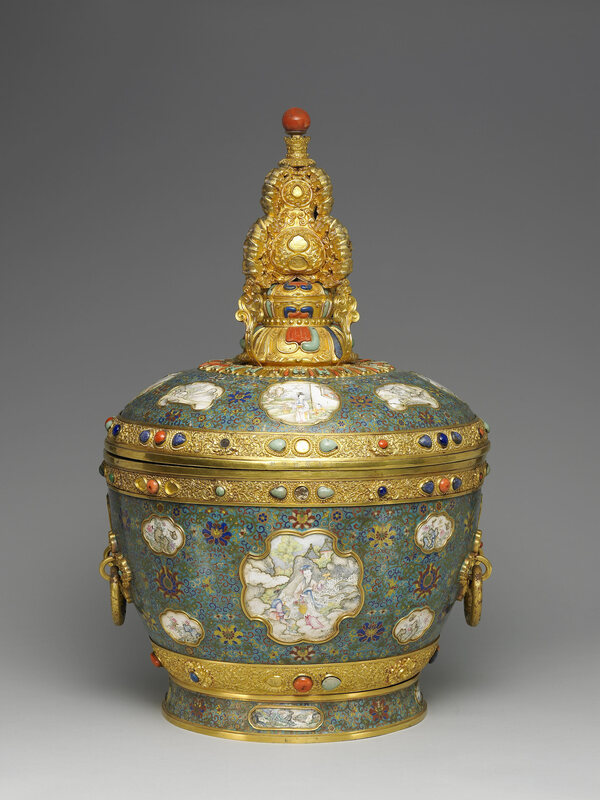 The use of these decorative panels was common on cloisonné in the West, although here the filigree work sets the outline of scenes of mountain huts, beautifully decorated with figurative paintings of ladies and butterflies, as well as landscapes, to enhance the overall three-dimensionality of the scene. 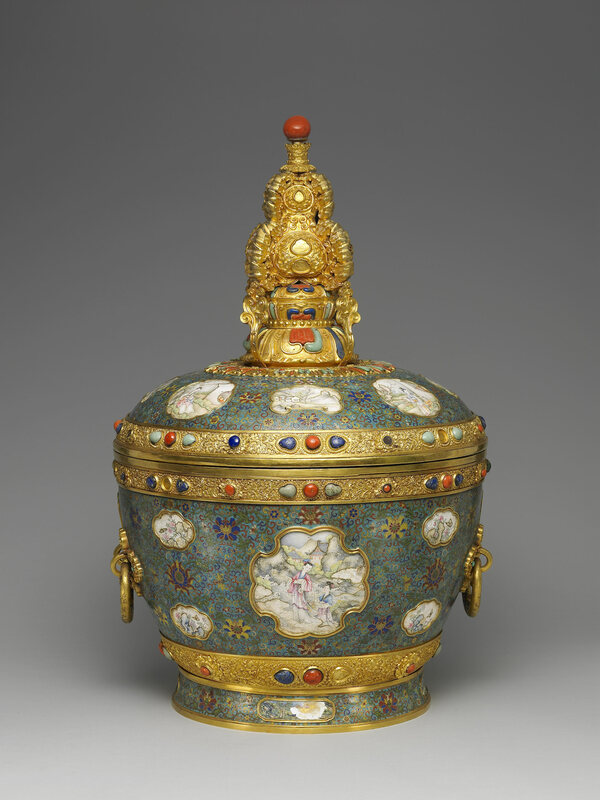 Qianlong reign cloisonné enamelware such as this, combining a range of cloisonné techniques and fusing Occidental and Oriental styles, were resplendent examples of the new era of cultural exchanges between China and the West.